When people are asked to picture a structural engineer or biomedical researcher, the image that comes to their minds most like is that of a male figure. 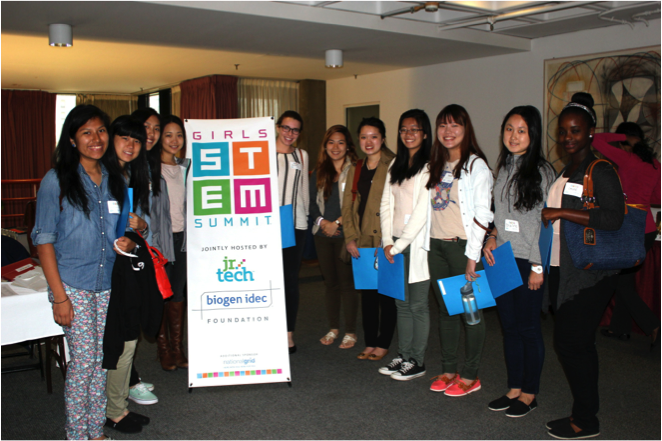 The Girls STEM Summit held at MIT on Saturday, April 26th was a step towards changing that stereotype. This Summit is organized by Jr. Tech, whose mission is to engage 4-12 grade students in STEM education. 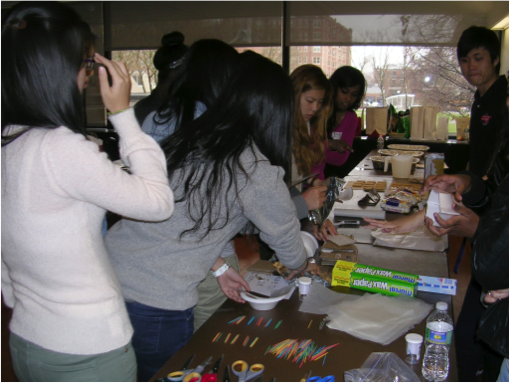 The Girls STEM Summit is a one-day workshop for young women in grades 8-12 who love STEM: Science, Technology, Engineering, & Math. The day consisted of a keynote speaker followed by six career sessions. The sessions were on Veterinary Medicine, Clinical Research, Civil Engineering, Food Engineering, Biotechnology, and Emergency Medicine. Supporting women, STEM students, and researchers is an essential mission of the Office of Science and Technology Policy. First Lady Michelle Obama said, “If we’re going to out-innovate and out-educate the rest of the world, we’ve got to open doors for everyone. We need all hands on deck, and that means clearing hurdles for women and girls as they navigate careers in STEM.” For centuries, stereotypes have been keeping women from science, resulting in a significant lack of women in the STEM workforce. In the United States, women represent 50% of the population and 49% of the US workforce, but only 24% of the STEM workforce. The percentage of men working in a STEM job with some college, an associate’s degree, bachelor’s degree, or master’s degree is triple or quadruple that of women with the same degree. However, women who work in STEM earn, on average, 33% more than their counterparts in other fields. Joining the national efforts, the STEM initiative of St. Mark’s 2020 Strategic Plan recently started a research project to help the school attract and retain more girls in our highest level STEM offerings. The day started out with a keynote speaker, Ms. Viney, Vice President of Immunology Research Group, Biogen Idec. Based on her personal experience, she gave us four simple lessons to succeed not only in the STEM field, but also in life in general. First, persevere. Second, seize opportunities. Third, find your passion, and fourth, ask for help. These lessons were concise but taught us the tenets of the road to a happy and successful life. The speaker of the Civil Engineering session works in the Boston area, and she showed us some of her works, such as a bridge in Newbury Port on Route 75. Her passion for her career subverted the stereotype that only males are capable of engineering work. After looking at some of her projects, she challenged us to build a tower with balloons that was tall enough to fit the tallest person in the group. Below is a picture of the tower we built! Do you ever wonder what the difference is between human doctors and veterinarians besides the fact that they treat different patients? Do you understand why some doctors choose to work with animals? 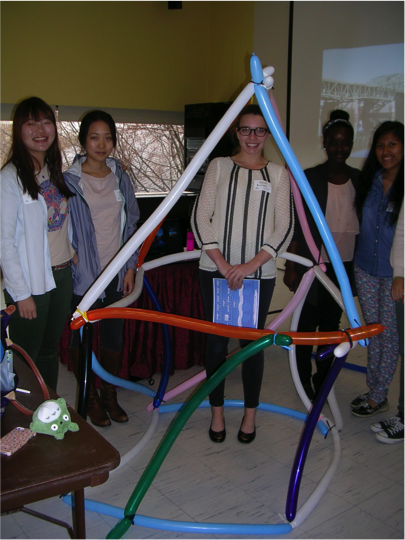 The Veterinary Medicine session was held by two graduate students from Tufts University. We were introduced to different types and challenges of veterinary medicine with a PowerPoint titled, “Real Doctors Treat More than One Species.” The foremost challenge is undoubtedly the communication barrier between veterinarians and their animal patients. As a result, the veterinarians are obliged to be meticulous and caring in order to successfully alleviate the sufferings of their patients. One seldom associates cosmetics with science. However, the session Clinical Research in cosmetic care introduced this interesting connection to us. The speaker is a scientist working in advanced research of L’OREAL products. It was fascinating to learn how physicists apply tension force to make hair curling products and how chemists experiment with different chemicals to make quickly drying mascara. The hands-on activities designed at each session engaged the students and let them appreciate the investigation and design process in scientific study and research. During the Food Engineering session, a group of students from Worcester Polytechnic Institute introduced how engineers are involved in food, from harvesting to storing and packaging. The activity was packing a s’more so it could pass three tests: drop, heat, and water. The challenge made me appreciate the wrappers that we mindlessly throw away everyday. A research scientist from Biogen Idec hosted a session on biotechnology. Biotechnology is defined as using living organisms for products. The activity was running a gel electrophoresis experiment. Gel electrophoresis is a method for separation and analysis of macromolecules and their fragments, based on their size and charge. This technique is widely used in biochemistry and molecular biology. In a case study, the students were challenged to use gel electrophoresis to determine whether someone is able to take a certain chemotherapy drug based on his/her DNA makeup. 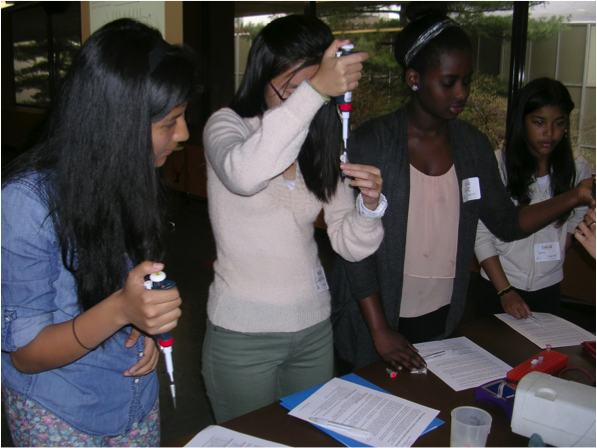 The girls were taught how to use an Eppendorf pipette to measure out minuscule amount of substance. 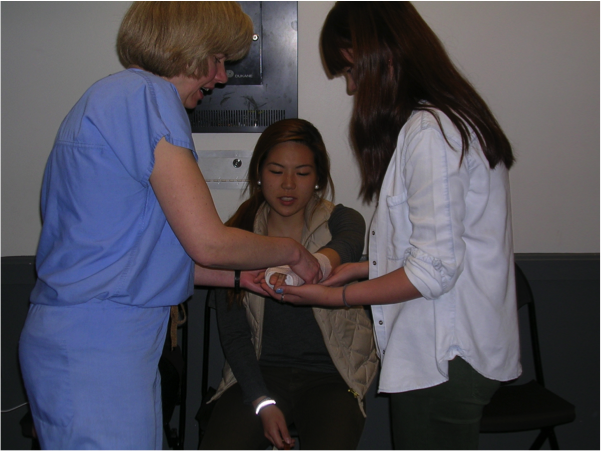 During the last session, a doctor that works at Emergency Medicine showed us some real cases, such as a woman who broke her wrist when she slipped on ice, and how to treat broken bones with splinting. She also taught us how to handle emergency cases with CPR and defibrillators. Her dedication to her job and her calmness in face of urgent medical issues make her so admirable. Astrophysicist Neil deGrasse Tyson once said, “Imagination alone is not enough, because the reality of nature is far more wondrous than anything we can imagine.”The fields of STEM are gaining increasing popularity nowadays, and women are an indispensable part of the advancement of science and technology. The Summit was a great opportunity to explore career paths we may have not known before, and how each session had hands-on activities engaged us in each field that we examined. Haley Jeon is a VI Former from Seoul, South Korea, and she lives in Elm House. She will be attending Georgetown University in the fall.